Once upon a time, in Lucky Girl Land, there were many diamond tennis bracelets given. Once was received by my friend, N., a beautiful, ebullient and stylish blonde who did as many recipients of such bracelets have: after an initial period of wearing, she stowed it in her safety-deposit box. Here, she's showing us the diamond bracelet, top, as well as (middle) a flexible-link "gold" bracelet, and (bottom) a CZ bracelet she's added for fun. N. is fun! In person, the diamonds are lively, and because of the clean design, she could definitely wear it as is. Plenty are being sold, but sometimes even if something is still made, it is no longer you. I suggested N. gift or donate the imitation gold x-link bracelet, which reminds me rather too forcefully of the '80s. She said, "I am weeping on my shoulder pads." If N. wanted a new diamond piece, here are some options. I'm linking to all the pieces used for ideas because not all of us have diamonds we're wondering what to do with! A timeless solution that she need never take off: the bangle. 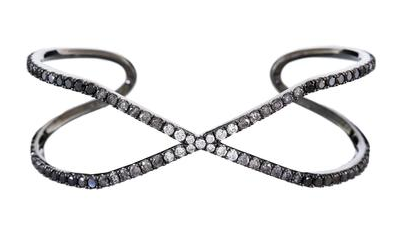 She could use all or some of the diamonds, to form an open or fully-closed circle. 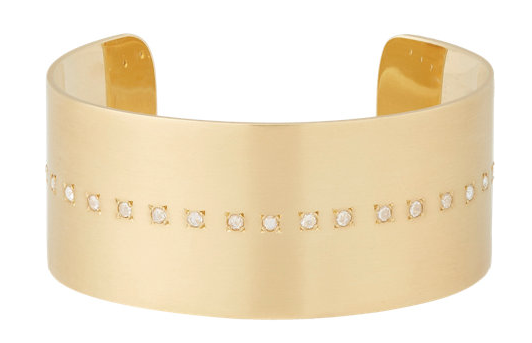 Shown: Simplicity Bangle by Carbon & Hyde; price, $1,265. She could also make a pair of bangles, one of her diamonds and the other of her diamonds mixed with other stones. A graceful arabesque motif in a more decorative cuff would use the stones for a version of these ornamental arches. 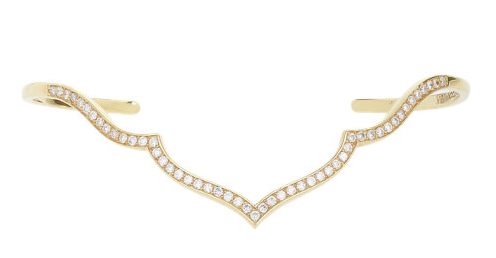 Shown, Sara Weinstock diamond and gold Taj cuff; price, $5,120. Not everyone would wear this, but I know N. could! If she wants links, here's an example of a more modern effect, bezel-set stones attached to a link bracelet. 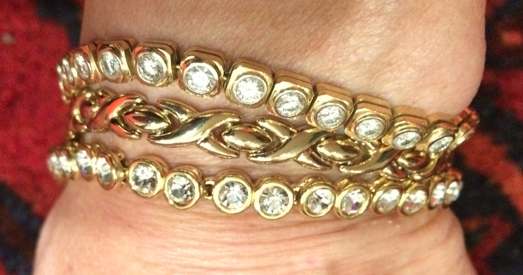 (Detail from Malcolm Betts' diamond and gold rolo-link bracelet; price, $6,505. With any reno project, the examples should percolate for awhile, and a good jeweler can advise on many variations. A successful collaboration will give N. a bracelet that never again sees the dark of a bank vault. But better to receive a good piece that can be so satisfyingly remodeled, than not! These are all glorious. I'm with Une Femme - how sad that I never managed to pick up a tennis bracelet in my magpie wanderings:). Alas I have no tennis bracelet in my jewel or safety box...so I will admire these from afar. If I did own one I would probably wear it every day! Blimey, all those diamonds must be worth a bit! Remember, you are looking at a photo; the difference was evident in natural light. The charisma of any gem stud, but especially diamonds, is in the quality of the stone, especially the cut. Unless the stone is top quality, a gemstone stud looks pedestrian or worse. But high-grade diamonds set as studs are gorgeous and very wearable. Recently I was at a party wearing diamond studs and a woman said, "Oh mine were $23 and you can't tell the difference." The other women looked at her kindly but said, "Oh yes you can." If you look at only average grade diamonds, simulants give those a good run. I also like diamond earrings in all sorts of other styles, and even a modest amount can look terrific in the hands of a great jeweller. My tennis bracelet was gracing the safe at home. My mom had given my oldest daughter her good pearls, but she is a diamond girl. My younger daughter LOVES pearls, wears nothing but, and was always stealing my good pearl necklace. Tennis bracelet went to 19yr old who is living in West Palm Beach and looks perfectly appropriate in diamonds any and all the time. Grandma's pearls have come to live with 17 yr old daughter and are worn constantly. My pearl necklace is now available to me when I want to wear it, without the discovery that oops! It went to high school today. Not quite a reno, but definitely a redistribution with all happy. Nelson Bartley: Delightful story, thanks! Oh, that arabesque cuff - how beautiful ... I never even knew that the bracelets shown were called tennis bracelets. I actually love the look of the original tennis bracelet. I own one, in white gold, and wear it all the time to work. It is clean, classic, simple. AN: As I said, plenty are still being made and worn. Some gifts have other associations (like the giver) so the owner may wish to alter it for that reason.